One-wheeled, GPS-guided robot pitched as an alternative to aerial units. Couriers everywhere struggle with the challenges of last-mile delivery, especially in urban areas. Now, an Israeli industrial designer has come up with a solution that strikes a balance between size, speed, and precision—"unicycle" delivery drones. The Transwheel Delivery Drone, an autonomous self-balancing single-wheeled robot, would be a grounded alternative to the high-wire concept of aerial courier drones, says inventor Kobi Shikar. 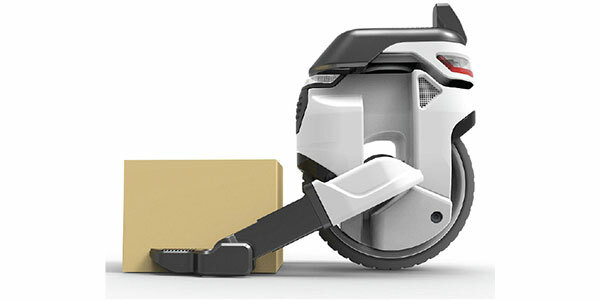 Instead of dropping packages from above, a sensor-packed, motorized unit would hold a package on its "head" via retractable robotic arms while it steered its way to its destination. The battery-powered drone would navigate by GPS signals while avoiding obstacles and negotiating traffic with a suite of on-board cameras. Upon arrival, it would use an Internet-connected camera to tap into social media sites, identify the recipient through facial recognition, and deliver the parcel. Designed for a graduate project at Shenkar College of Engineering and Design in Ramat Gan, near Tel Aviv, the Transwheel delivery robot is still in the concept stage. But as Shikar seeks financial backers, he says the idea of an automated parcel delivery vehicle is more likely to pass regulatory scrutiny than flying drones encroaching on commercial airspace. To see a concept video of the drones in action, click here. Feedback: What did you think of this article? We'd like to hear from you. DC VELOCITY is committed to accuracy and clarity in the delivery of important and useful logistics and supply chain news and information. If you find anything in DC VELOCITY you feel is inaccurate or warrants further explanation, please contact Chief Editor David Maloney. All comments are eligible for publication in the letters section of DC VELOCITY magazine. Please include you name and the name of the company or organization your work for.